Railpictures.ca - Michael Berry Photo: A late CN 149 is exiting the Port of Montreal with CN 2106, GECX 9124, CN 2502 and 188 platforms. Both of the first two units are ex-UP, with CN 2106 formerly being UP 9071 (built as CNW 8559) and GECX 9124 (still in UP paint) was formerly UP 9385. | Railpictures.ca – Canadian Railway Photography – photographie ferroviaire Canadienne. 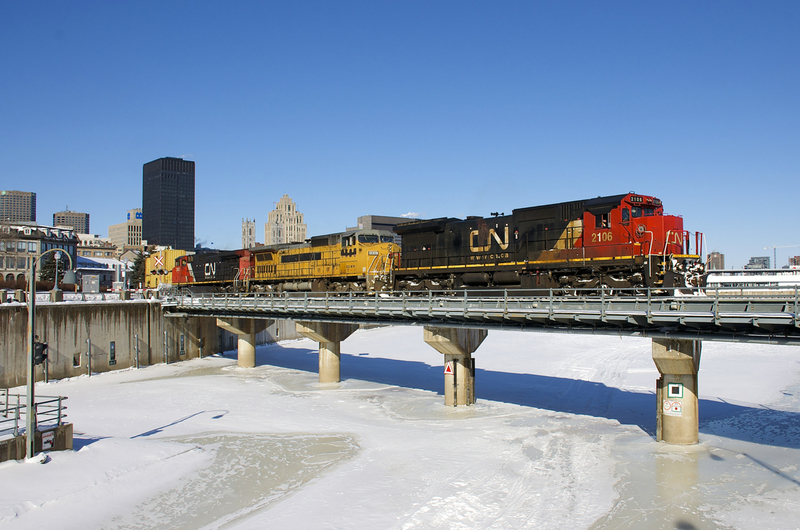 Caption: A late CN 149 is exiting the Port of Montreal with CN 2106, GECX 9124, CN 2502 and 188 platforms. Both of the first two units are ex-UP, with CN 2106 formerly being UP 9071 (built as CNW 8559) and GECX 9124 (still in UP paint) was formerly UP 9385.